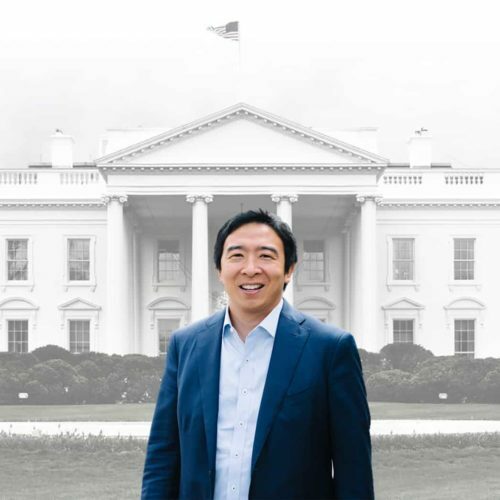 Lawyer-turned-entrepreneur Andrew Yang has never occupied elected office. That’s not stopping him from running for the White House as a Democrat. The Schenectady, N.Y., native and son of Taiwanese immigrants is running on a platform of “human-centered capitalism,” which he says would maximize Americans’ well-being and fulfillment. Yet he has a bleak outlook on the future and the technology that is destined to take over as many as, he estimates, one in three American jobs. Yang’s lengthy platform is topped by one core goal: to give every American adult $1,000 per month, no strings attached. His plan for universal basic income, or a “Freedom Dividend,” would create jobs and partially allay the doomsday scenario he believes America is headed for as more workers are replaced with robots. There are roughly 253.2 million adults over the age of 18 in the United States, according to the Census Bureau, meaning Yang’s Freedom Dividend plan would cost, roughly, $253.2 billion … each month. Yang plans to raise money for a $1,000-a-month stipend through reducing dependence on welfare and other social safety nets and by adding a “value-added tax,” a structure commonly used in Europe that taxes a product at each stage of the supply chain. Yang says his plan would recapture a significant portion of revenue lost when companies wriggle through tax loopholes. Running for president nowadays costs a lot of money. President Donald Trump has already raised more than $67.5 million toward his re-election, as of Dec. 31. And Sen. Elizabeth Warren, one of the many candidates Yang is running against for the Democratic party’s nomination, has more than $11 million she’s able to carry over from her previous U.S. Senate race. Through Dec. 31, Yang’s presidential campaign committee, Friends of Andrew Yang, had raised $608,600 since he launched the committee in November 2017, according to Federal Election Commission documents. He believes he’ll be able to raise the millions he needs from supporters in the tech industry, according to The New York Times. Yang is one of nine federal candidates, parties and super PACs that received cryptocurrency donations in the 2017-2018 election cycle, according to an analysis of federal records by the Center for Public Integrity. Friends of Andrew Yang received two Bitcoin and Ethereum contributions worth about $2,600 apiece in 2018. When Manhattan Prep, one of Yang’s companies, was sold in 2009 to Kaplan, the testing firm owned by what’s now the Graham Holdings Co., Yang “walked away with some number in the millions,” according to an interview he gave to Freakonomics. That was after Yang had worked other jobs: as a lawyer at Davis Polk; an entrepreneur with StarGiving, a nonprofit that recruited celebrities to donate to charity during the early 2000s; and as a Cutco knife salesman. Yang draws a direct line between income inequality and the Supreme Court’s Citizens United v. Federal Election Commission decision, which allowed corporations, unions and certain nonprofits to raise and spend unlimited amounts of money to advocate for and against politicians. Because of the ruling, Yang says on his website, a handful of ultra-wealthy donors have more influence over politicians, who in turn write laws that benefit the wealthy. He wants to overturn Citizens United, eliminate super PACs and create a system in which elections are publicly funded. “We will return to the essence of democracy — where each person’s vote is heard and treated equally,” Yang said. His agenda also includes issues that are normally reserved for local planning commissions, such as relaxing zoning laws to pave the way for more affordable housing and finding new uses for abandoned shopping malls. Yang’s agenda isn’t exclusively serious. He wants to make the day taxes are due a “fun” federal holiday. Americans would have the option of allocating 1 percent of their taxes to a specific project, department or activity. “Revenue Day should be a day of joy and celebration for our national community,” Yang said. Sources: Center for Public Integrity reporting, The New York Times, Rolling Stone, U.S. Census Bureau, Investopedia, Business Insider, Federal Election Commission, Freakonomics, Venture for America 990s, Guidestar. I agree with you. Automation/AI is here and people have no idea the real issues that Andrew is raising. Just Google or search through Youtube to see what companies are doing. It’s a wonder why major news outlets aren’t giving him a platform. Good thing he’s made it to the debates to give people something to think about. Andrew presents a road map forward based on the reality of the present day and how technological developments are scaled to impact us in the near future. One can’t define him in any way other than someone who has a specific plan to solve problems of our country without the ideological philosophies of the left and right.